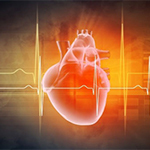 SATURDAY, March 29, 2014 (HealthDay News) -- People with celiac disease have a nearly twofold increased risk of heart disease compared to those without the chronic digestive disorder, according to a new study. Researchers analyzed data gathered from nearly 22.4 million people, aged 18 and older, between 1999 and 2013, including more than 24,000 diagnosed with celiac disease. Those with celiac disease were slightly more likely to have high cholesterol but less likely to have high blood pressure, the investigators found. The overall rate of heart disease was 9.5 percent among celiac disease patients, compared to 5.6 percent among those without the condition, the study findings showed. Among people younger than 65 years of age, 4.5 percent of celiac patients had heart disease versus 2.4 percent of those without the condition. Celiac disease patients also had a slightly higher risk of stroke, according to the study scheduled for presentation Saturday at the American College of Cardiology (ACC) annual meeting in Washington, D.C.
People with celiac disease have an immune and inflammatory response in the small intestine when they consume gluten, a protein found in grains such as wheat, barley and rye. These findings add to growing evidence that chronic inflammation may play a role in heart disease, the study authors said. However, although the study found an association between celiac disease and heart disease in patients, it did not prove a cause-and-effect relationship. "People with celiac disease have some persistent low-grade inflammation in the gut that can spill immune mediators into the bloodstream, which can then accelerate the process of atherosclerosis and, in turn, coronary artery disease," study co-author Dr. R.D. Gajulapalli, clinical associate at the Cleveland Clinic, said in an ACC news release. "Our findings reinforce the idea that chronic inflammation, whether it's from an infection or a disease, can have an adverse role in coronary artery disease and heart health in general," Gajulapalli added. The study is important, he said, "because it highlights a specific patient population who might be at higher risk for coronary artery disease, even in the absence of traditional cardiovascular risk factors." However, the data and conclusions of research presented at medical meetings should be viewed as preliminary until published in a peer-reviewed journal. Large studies are needed to confirm the link between celiac disease and heart disease, and to determine how the severity of celiac disease may affect heart disease risk, Gajulapalli noted. About one in 133 Americans have celiac disease, but up to 80 percent of those with the condition are underdiagnosed or misdiagnosed with disorders such as irritable bowel syndrome or lactose intolerance.